Anyone else dreaming of a sunshine-filled vacay? Skip work for a few days and head to the Northern Territory to soak up the sunshine, get up close and personal with the crocs, and dance the night away with travellers from across the globe. 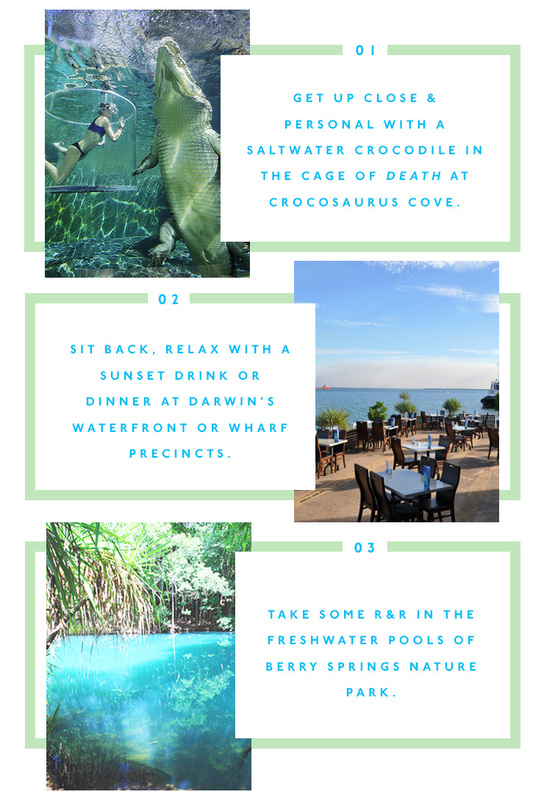 Here’s how to spend a glorious 48 hours in Darwin. Check into the Vibe Hotel Darwin Waterfront. A boutique hotel set amongst the entertainment and dining hub of Darwin’s seafront promenade, Vibe is surrounded by great shopping, a range of pubs, restaurants and cafes – the perfect place for your to stay and play! All rooms feature complimentary Wi-Fi, air-conditioning (because winter in Darwin is hot, hot hot! ), in-house movies through the 40” TV, a mini bar and a room service menu! Plus, the hotel is just a hop, skip and a jump away from the Waterfront Lagoon, which hosts a range of water sports and outdoor activities and Bicentennial Park and Esplanade or the famous Stokes Hill Wharf. Once you’ve dropped your bags, jumped on the bed and readjusted the air-con, jump in a taxi and head to Stokes Hill Wharf to watch day turn into night as you take in the panoramic view over the ocean with a few cold ones. Originally dating back to the late 1800s, the Wharf has been rebuilt a number of times, most recently in the 1950s after it was severely damaged in the Japanese bombing raids of 1942. 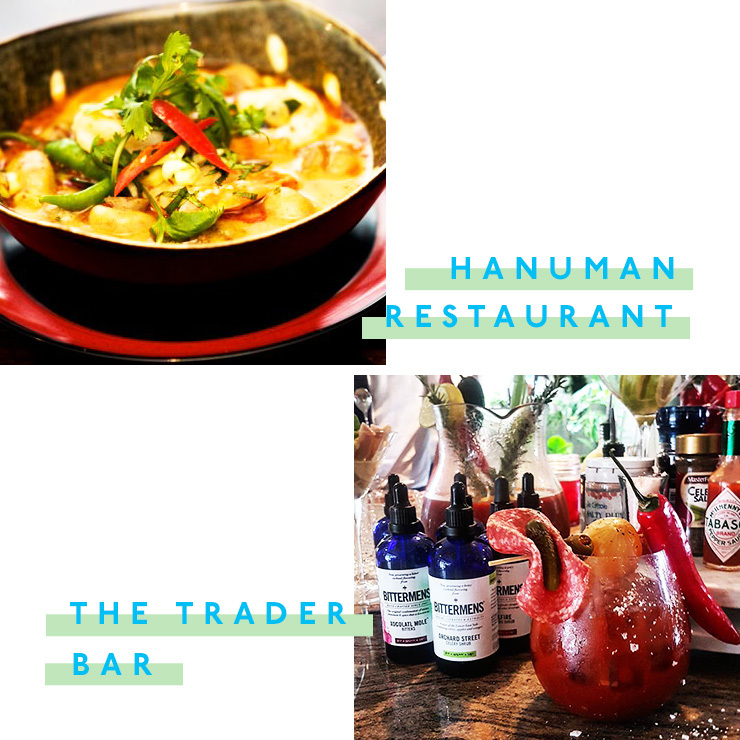 Take advantage of the warm weather and frock up then head to Darwin’s main entertainment precinct, Mitchell Street, for dinner at Hanuman. It only took one trip to Darwin, in search of fresh barramundi for his customers in Melbourne, to convince chef and owner Jimmy Shu to sell up his Melbourne based restaurant empire and move north (who can blame him!). Get the party in your mouth started with some oysters with vivid tastes of lemongrass, sweet basil, ginger, chilli and fresh coriander, or try the wild barramundi fillets cooked with turmeric, fresh curry leaf and coconut. Top it all off with a piece of Sri Lankan Love Cake. With your stomach happy, it’s time to partyyy! Head over to The Trader Bar in Harriet Place where all the drinks are ‘made with love’. When in Darwin, do as the locals do and be sure to try to Australia Green Ant Gin. Traditionally favoured by Indigenous societies for their medicinal benefits and protein content, green ants display vibrant flavours of lime and coriander. This unique bush tucker is hand-harvested in the Northern Territory, but remember not to have too many, because you’ll want your wits about you when you come face-to-face with a croc tomorrow! It’s recovery time so head down to the Darwin Waterfront to begin your morning with breakfast and a side of ocean. Make sure you pack you bathers so you can stop for a swim, paddle or play at the Wave or Recreation Lagoons on your way back. Don’t forget to slip, slop, slap! When you need to fuel up for the day, pop over to Alley Cats Patisserie on Mitchell Street. Carb-load for the day with their delicious, freshly made waffle topped with pumpkin custard, pecans, gingerbread parfait and toasted marshmallows. Explore Darwin on foot with a guided two-hour heritage walk where you’ll visit the city’s historic landmarks and learn about its unique history including WWII bombings, Cyclone Tracy, the 1800s gold rush, and its Aboriginal culture. 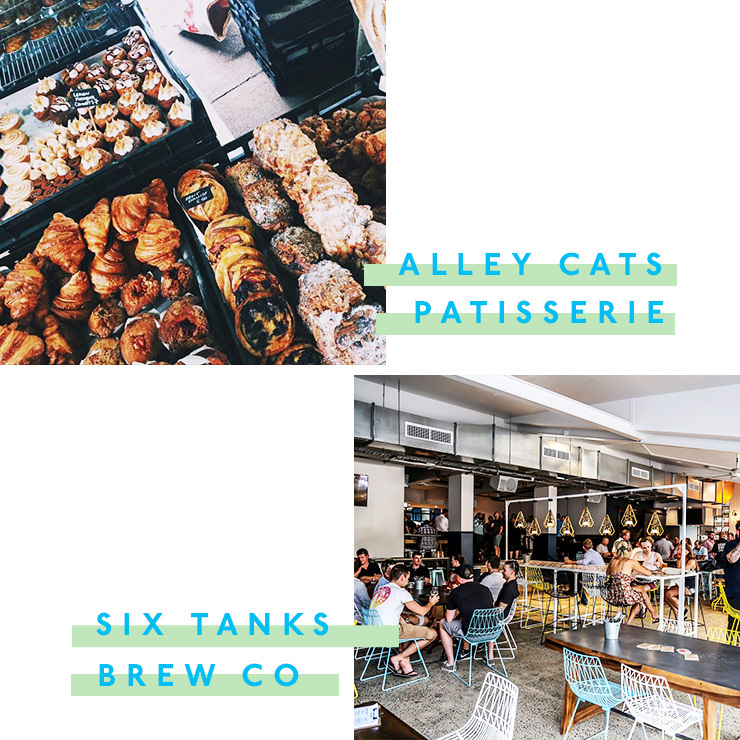 With the temperature rising, cool down with a cold beer from and a bite of lunch from Six Tanks Brew Co on Mitchell Street which features large polished brewing vats as a backdrop. Six Tanks offers a variety of hand-crafted, traditional craft beers complemented with a selection of high-end boutique wines and spirits unique to Darwin, and a meat-lovers menu featuring ribs, slow-cooked lamb, marinated or smoked pork, and beef. On a full belly, make your way across Mitchell Street to Crocosaurus Cove to get up close and personal with the largest reptile on the planet: the saltwater crocodile. If you’re feeling particularly brave, grab your GoPro, throw on your swimmers, take a deep breath and climb in to the Cage of Death for a face-to-face encounter with one of these massive prehistoric beasts! There’s no doubt this #instaworthy bucket list item is one hell of an adrenalin rush. If you’re after a little retail therapy (and to do your bit for Darwin’s economy because #selfless) drop by Viva La Body on Cavenagh Street, a gorgeous little boutique stocked from floor to ceiling with glamorous, vintage-inspired pieces in sumptuous fabrics, and a divine award-winning range of palm-oil free soaps. Raw Cloth on Smith Street has also developed a cult following for its retro-inspired dresses made from swirling European material and fabrics printed by the Top End's Indigenous arts centres. But be warned – you’ll find it a struggle to leave without making a purchase! As the daylight hours start to wane, return to the waterfront to board a 50ft Sail Darwin catamaran for a sensational dinner cruise to watch a magnificent tropical sunset from the water. Kick off your shoes, grab a glass of bubbly, and enjoy an eight-course feast including fresh local seafood. Once you’re back on dry land, keep the party going and head to The Precinct Tavern at the Waterfront for a cocktail or wine and dance the night away to live entertainment in the Pub Bar. If you'd prefer a cold beer to end your night, they have 46 beers and ciders on tap as well as a full bar so you will be sure to find a drop to tantalise your tastebuds! One of the best things about staying in a hotel is ordering room service, so give your tastebuds a treat and order up a delicious breakfast in bed while you plan the day’s adventures. Pack a picnic, get back to nature and let your worries fade away as your soak under a waterfall in Litchfield National Park. Just two hours out of Darwin, here you can wander through the lush monsoonal rainforest to the postcard-perfect swimming hole for an invigorating dip. If your energy levels are low, cool off at Buley Rockhole, a series of cascading waterfalls and rockholes just 80 metres from the car park. If you’re up for a walk, head in to the spectacular double waterfall of Florence Falls set amid the monsoon forest where 135 steps lead down to a plunge pool! Don’t forget to share a selfie in your bikini (think #FromWhereYoudRatherBe) so everyone back home knows what they’re missing! Make the most of the balmy weather and unwind with a few brews and a flick at the Deckchair Cinema, located just a short walk from the hotel along the Esplanade. Run by the not-for-profit Darwin Film Society, this open-air cinema is extremely popular and screens a mix of Australian, popular, family, foreign and classic films from April to November. Make the most of the experience and relax under the stars enjoying their onsite bar and food stalls.